Pepper Sauce has to be one of my favorite condiments, so much so that I don’t even like calling it a condiment. Hot Sauce gives your food a nice welcomed kick. It can make the tastiest of dishes taste better and the worst of dishes taste better as better. However, not all Hot Sauces are created equally. There are some that are so mild that you’re left wondering where the actual pepper even went. Then there are others that are so spicy, you need a whole day to recover from the burn! I personally, like a medium bodies Hot Sauce. Something that adds spice and flavor but doesn’t compete to take the main stage from the food that you’re eating. I remember working in Midtown Manhattan and meeting my friend Janelle for lunch. No matter what we ate or what we ordered, she always had Pepper Sauce handy and ready. She had hot sauce in her bag before Beyonce even made it a thing! It wasn’t long, before Janelle was supplying me with her grandmother’s famous Trini Pepper Sauce. She’d store it in old seasoning bottles, which made it all of the more special! In time, I learned how to make my own Pepper Sauce and I became obsessed so much so that I even planted peppers in my garden. It took me three whole years to figure out the right sun-to-shade combo right! (Can you tell that I’m equally proud yet frustrated at myself? Ha!) I eventually free-styled my own Pepper Sauce all the while keeping Lorna’s recipe at the heart of it. 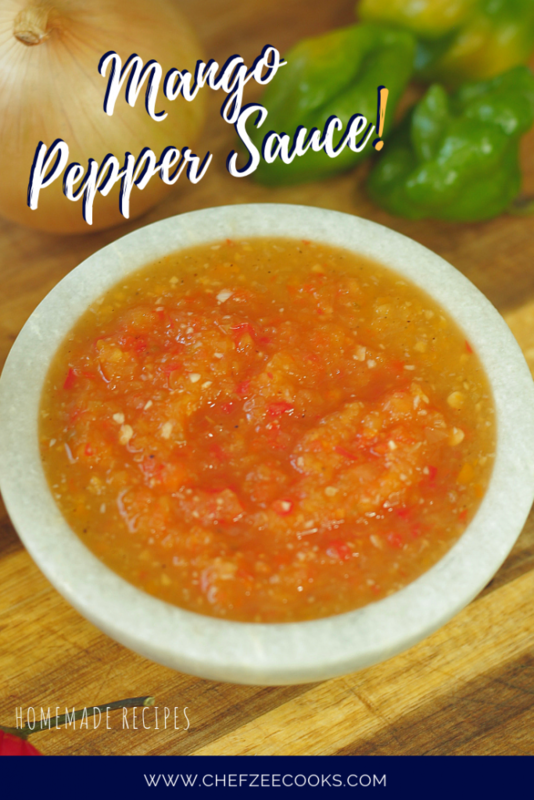 Before we dive into this easy and vegan– yes vegan!– recipe, I’d like to note that when making your own pepper sauce, you can season this to your liking! You can also make it as spicy as you want keeping in mind that the pepper seeds is what actually makes a pepper hot! So if you’d like to skip out on the extra spicy, simply omit the seeds or use less peppers. For today’s recipe, I’m using one of my favorite spicy peppers– Jamaican Scotch Bonnet Peppers. They’re a close friend of the family as I’ve featured them in many of my recipes like my Dominican Oxtails. Scotch Bonnet Peppers are VERY close cousins to Habanero Peppers so feel free to use those instead if that’s all that you can find. Lastly, as you can probably guess from the title, this recipe calls for some tasty Mangoes! The fresher and riper, the better but it’s totally understandable if you’re making this recipe when Mangoes aren’t in season. Simply use frozen Mangoes. They’re typically picked, packed, and frozen when they’re ripe so this dish will still come out tasty! 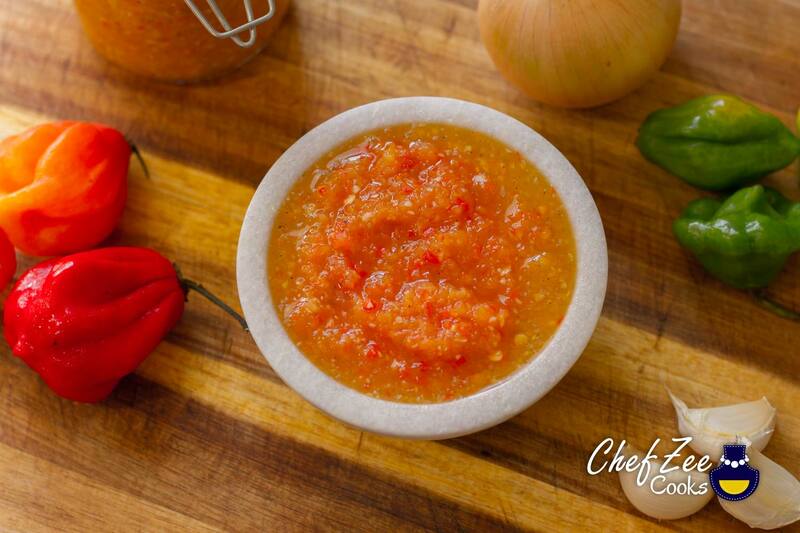 You’ll want to be careful be heating up this pepper sauce in a sauce pan. This recipe has sugar which will begin the caramelize and thus stick to the pot. Always stir constantly and know that the longer you warm up the sauce, the spicier it will be. This is because we’re activating those yummy spicy oils from the scotch bonnet peppers. In turn, we’re also deepening the sugar from the Mango and Brown Sugar. In the end, we’ll have a Pepper Sauce that’s both spicy but subtly sweet. If you have a sweet tooth, feel free to add some more sweetness than what the recipe calls for! Oh and if you like a much runnier-looser Pepper Sauce, feel free to blend the ingredients more, add more vinegar or even water. If you add more vinegar, simmer it for a few minutes just to kill off that strong vinegar bite! And finally, if you like a super smooth Pepper Sauce, strain it at the end. I personally, love all of the bits in my Mango Pepper Sauce! Be sure to Pin this Yumminess to your Pinterest Boards! Transfer Mango Pepper Sauce into storage bottles or mason jars. Enjoy with your favorite dishes! Please note that Mango Pepper Sauce will keep in the fridge for a few months. Be careful when handling hot peppers. Avoid touching your face, especially your eyes!